In stock 207 items in stock. Hi, running 1.7.6 is probably going to be a necessity, but both 1.7.6 and 1.6.5 are currently the latest versions. 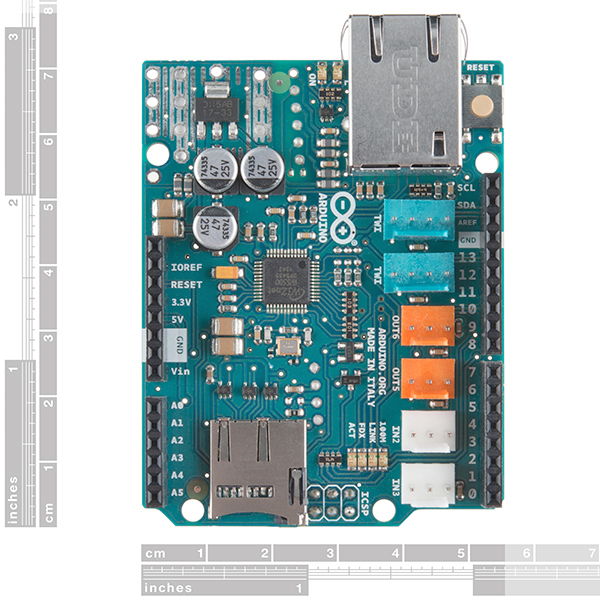 One is provided by Arduino.org, the other by Arduino.cc and have different features. Because this shield is made by Arduino.org you will need their version to get the example code. It is not so much that Arduino.cc is behind the times, but that Arduino.cc and Arduino.org are currently working against each other instead of with (which is unfortunate for you the customer). Hi, Is this shield compatible with Arduino/Genuino 101? If youâre having trouble getting this to work, make sure youâre using the Ethernet2 library, which ships with Arduino IDE 1.7.6. Youâll find the example code in the Examples menu and it should work right out of the box. Newest versions are at: http://www.arduino.org/software . Arduino.cc is behind the times, offering 1.6.5 at the time of this writing. It barely mentions PoE. Is that really available and will it power a UNO? You need the SilverTel PoE module to complete it. It should be AG9120S, at least that's what the old Arduino Ethernet and Ethernet Shield used. Hi, I am a bit confuse, is this shield POE or not POE? does it need something else to be complete, as mention by user jpbot, or is it POE as it comes? 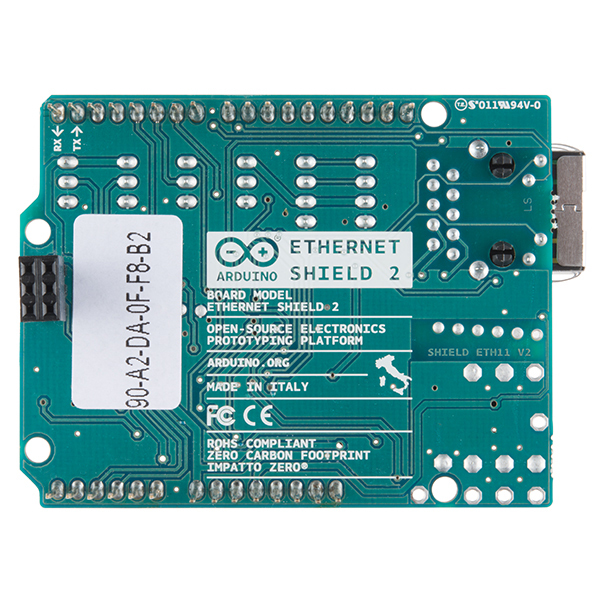 Well, after the research below I found that I should have looked closer to home, From the product description above: "The Ethernet Shield 2 has a standard RJ-45 connection, with an integrated line transformer and Power over Ethernet enabled." So this must be the A000025 flavor. The problem is that I cannot find which version this is anywhere on this page. A quick search showed that the PoE version is available a few places, but I'd like to know if this is one of them before being forced elsewhere. Yes, but nowhere on either Arduino.cc or Arduino.org (that I can find) is there any information on how to actually procure one of those modules. I'll repeat my request here from the new-product page. 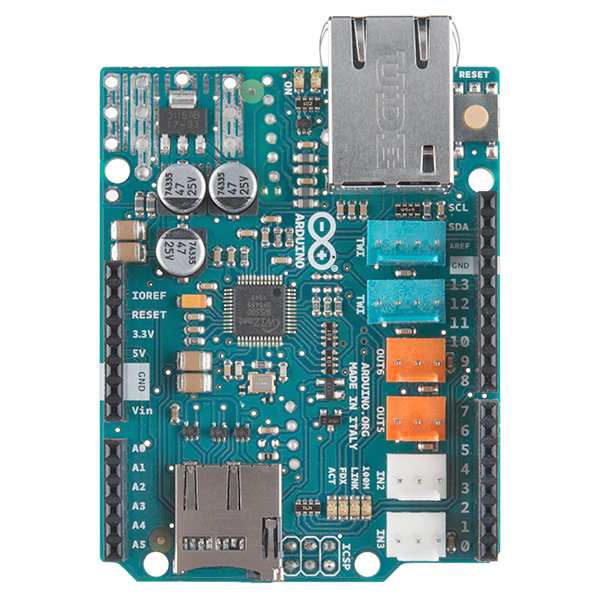 Would SparkFun be able to stock the module that the Arduino ethernet shields and boards are designed to use? It would be nice because they aren't stocked with the usual guys (Mouser and DigiKey), semiconductorstore.com will is where I picked them up in the past for quite a bit less than the hobby/maker places that do bother to try selling them from time to time. Sadly it looks like they're not in stock at the moment but you can order them and I'm sure a nice person will call you to advise you on the delay. This requires the Arduino.org IDE and libraries (see the as of yet unresolved issues with Arduino.cc and Arduino.org). Additionally, the webserver example stops responding after a while. I recommend finding a different Ethernet solution for your Arduino project at this point. So to ask the obvious but unasked question, since the specs of the wiznet 5200 and 5500 chips (and therefore the shields based on them) are so similar, is there a burning reason to switch to the 5500-based shield? Is the 5200 chip or 5200-based shield going obsolete? 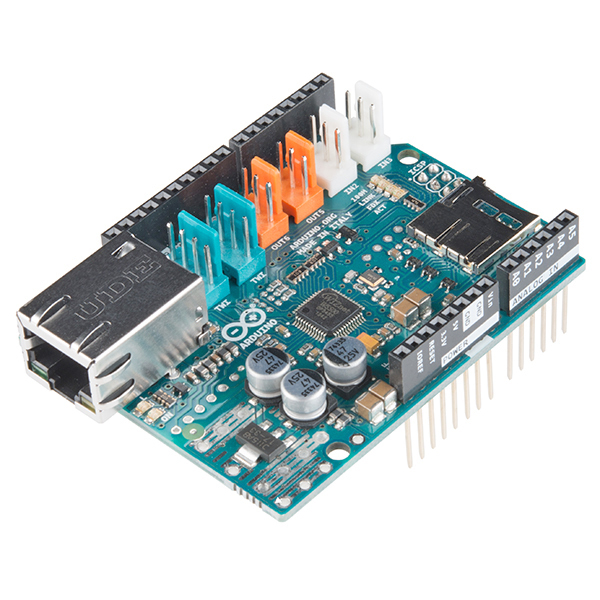 I make a product built around an Arduino Ethernet board; does the 5500 shield do something better/cheaper/faster/more reliably (notwithstanding the issue of Mega reset compatibility -- I'm using Unos)? Make sure you're running Arduino IDE 1.7.6 or later! Great board, as good or better than previous versions. If you're having trouble getting this to work, make sure you're using the Ethernet2 library, which ships with Arduino IDE 1.7.6. You'll find the example code in the Examples menu and it should work right out of the box. The hardware is great - it arrived quickly and works well now that I have the right library. Getting the library was more challenging. I had been successfully using the Arduino.cc IDE, but this is an Arduino.org product that is not supported by the Arduino.cc IDE. So I downloaded and installed the Arduino.org IDE, which installed a bunch of new drivers. I was then able to successfully load sketches to my Uno, but I couldn't get the monitor port to work for more than a handful of characters before turning to jibberish. After several hours of unsuccessfully searching for an answer on the web I uninstalled the Arduino.org IDE, reinstalled the Arduino.cc IDE, and extracted the library for the Ethernet Shield 2 from the Arduino.org download. All is now good. Setting up mini-server for test purposes. Samples gave me a good start. The file support on SD is a great feature. I mated it to a Mega board. FYI, it doesn't work with the stock Ethernet libraries that come with the Arduino IDE. They don't support the W5500 chipset, so you need to find/download newer libraries that do. Once I did that it worked great.